New restaurants on 5pm Dining: Cocktails and Steaks in Uddingston. There are always new restaurants joining 5pm Dining. Now you can book Edinburgh's Grand Café and Uddingston's Cocktails and Steaks via 5pm. A premium steakhouse, Cocktails and Steaks opened on Main Street in Uddingston last year. Formerly a tobacconist, the space was converted into a handsome restaurant complete with a new mezzanine area. As the name implies, cocktails and steaks are at the heart of the offer. The steaks are Scotch beef, dry aged for 28 days and cooked in a Josper grill. They range from a D-rump steak all the way up to the steak platter which features rib-eye, sirloin and rump steak. Customers can also order speciality cuts such as tomahawk, Chateaubriand and Porterhouse by weight. Other options include the 7oz Butcher's Burger; Scottish salmon with sautéed potatoes and a wild mushroom and courgette Stroganoff. As well as an a la carte menu, Cocktails and Steaks also offer a pre-theatre menu, a Saturday menu, a Sunday menu and a new light bite and lunch menu. 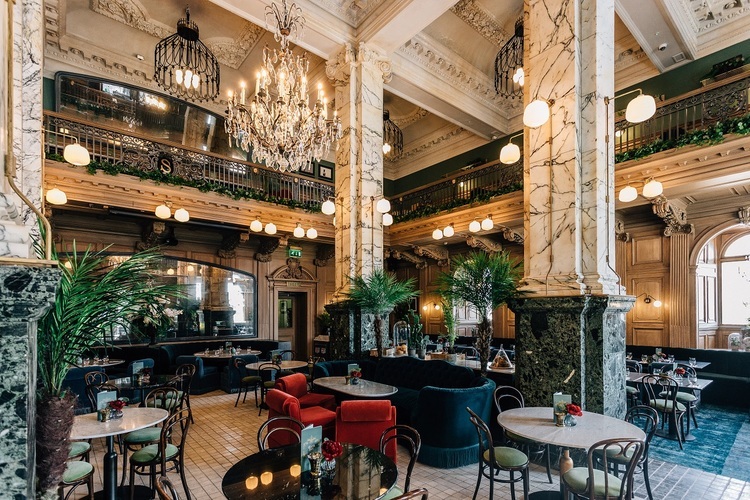 The opulent interior of Grand Café at the Scotsman. If we zap across the M8 then The Scotsman Grand Café & Bar is one of the new restaurants to join 5pm Dining in Edinburgh. We have written about it a couple of times before on the blog. After a six month restoration, the North Bridge venue re-opened in June. Set within the former advertising hall of The Scotsman newspaper, the new venture is inspired by the ‘Grand Cafés’ of Europe. Dating back to 1905, the spectacular double height space seats 150 covers across its ground floor and balcony. It is a stunning room. Original walnut wood panelling, marble pillars and ornate cornicing have been carefully brought back to life by interior specialist Jim Hamilton. The kitchen is led by Chris Niven, a finalist from the 2017 Masterchef: The Professionals show. The Dundee-born Head Chef has created a range of menus that run from breakfast bowls of porridge to 28-day dry aged Buccleuch beef steaks and burgers. Scottish producers are very much to the fore with dishes such as mac and cheese made with smoked Arran cheddar; Loch Fyne oysters and a steamed marmalade pudding. While the Grand Café will have the buzz of a vibrant modern café bar during the day, it will also stay open until 3am every night. Live piano music will be played on the balcony baby grand, with in-house pianists taking requests into the small hours. There will also be regular entertainment on offer for guests, including live jazz until late every Thursday. Did we mention that you can book the Grand Café via 5pm Dining? Keep checking back on the 5pm Dining blog. We'll bring you all the latest on new restaurants in Glasgow and Edinburgh as we get it.